Here is the second instalment of our paper on e-resonance. You can find the first instalment here – first instalment – and the PDF of the full article here – The Riddle of Online Resonance. There will be one further instalment after this one. We decided to post in three instalments to make reading of the paper online easier and to allow time for reflection and comment, which we would welcome, either here in this blog, on Matthias’ blog or elsewhere. Whilst recognising that verbal/nonverbal and personal/conceptual ingredients are all intertwined, it is helpful to separate these out when trying to understand e-resonance. On a personal and social level there are many indicators of e-resonance. These often have emotional or affective associations which may be articulated verbally or ‘sparked’ by feelings of empathy, excitement and stimulation evoked by the online message/post – as illustrated in the following blog post. The resonating post might also fulfil a previously unrecognised gap or need in the reader’s learning/experience leading to new aspirations and stimulating further interest. Alternatively, it might not be the content of the post itself that ‘sparks’ the resonance, but rather a secondary topic, such as a mutually shared interest, which is revealed on the online site. Thus the initial resonance on this personal and social level may not be caused by the original message intended by the author. Despite this the post may answer questions that are personally current and relevant to the reader, or ‘catch the eye’ through key words that are significant in some way, perhaps presenting new possibilities or a ‘rarely found’ way of interpreting the topic. The authors have considered this ‘relating to a topic in a rarely found way’ as follows. If two concepts are normally regarded as rather distant, and a long argumentation chain is needed to get from one concept to the other, then a trigger for resonance might be if a blog post contains these two concepts close together or with a short argumentation chain. Although the post might become less understandable for people who have not yet thought about these concepts, it will catch the eye of the person who did care about it, and this, in turn, increases the feeling of connectedness between the two ‘initiated’ people. This resonance and connectedness cannot be ‘sparked’ simply by explicit mutual interests or catchwords that could be ‘Googled’, but is something that ‘catches the eye’ when you might not know why. The eye may also be caught on the conceptual level. As noted by Siemens (2008), connections do not only occur on the personal/social level, but also on neural and conceptual levels. If we see the result of resonance as an observable personal connection (manifest in, say, one’s blogroll), we still need to consider how the conceptual connections are made. These conceptual connections are not individually observable (as sparking), but are gradually strengthening in a simultaneous fashion involving multiple verbal and non-verbal concepts. E-resonance on a conceptual level is like ‘being able to see a lighthouse beacon in a conceptual fog’. E-resonance can therefore be thought of as ‘something beyond’ the message content, something non-linear and non-linguistic, which offers the possibility of a ‘glimpse into the mind’ of an online author. Magdalena Bottger’s (2005) diagram and discussion of how ‘Pieces of information can (only?) 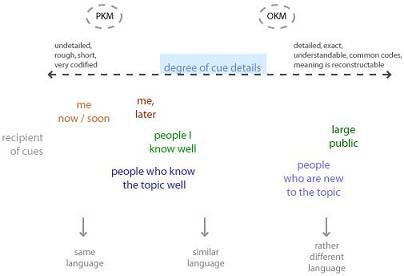 be “cues to knowledge” which means they give us hints to the knowledge in our head’, is helpful in trying to visualise what ‘beyond verbal’ might mean. In this diagram, we can see that the closer we are to her individual, personal thinking, the more un-detailed, rough, short and codified her cues. The authors believe that in thinking of online resonance it is helpful to visualise ‘beyond verbal’ as even further left on Bottger’s axis of degree of cue details. Perhaps online resonance is ‘located’ nearer to the recipient’s mind than to the communication channel. In relation to these attempts to understand what ‘beyond verbal’ might mean, it is interesting to consider the work of authors such as Downes (cited in Jones, D. 2010) and Wenger (1998). Both point to phenomena that go beyond the hitherto prevalent primacy of verbal communication that takes place in a transport-like fashion where, in principle, the meaning of a word in the sender’s and recipient’s minds match (sameness). For Downes (2006a) online communication and connection is about pattern seeking. Wenger goes beyond the verbal world with his emphasis on practice (in the semantic triangle this shifts the focus from symbols to the real-world referents), on doing and feeling and negotiating meaning. His concept of identity also allows for diverse aspects at both ends while still yielding successful communication and he allows for vagueness and similarity rather than sameness (Wenger, 1998, p.77). These different approaches each implicitly acknowledge the possibility of ‘beyond verbal’ communication and a deeper level of understanding through less formal modes of communication and online resonance. This filtering is not an active exercise, but more passive, rather like laying traps or casting a net or using many fishing rods. It is a serendipitous pleasure when somewhere among the many rods and vast fishery nets of an RSS aggregator, some resonance indicates a catch. An alternative analogy for the unconscious nature of e-resonance could be in trying to see falling stars. To discover a resonating conceptual aspect and probably also a resonating personal trait (one mediating the other) is as if you wanted to discover a falling star: If you consciously watch out for one in one corner of the sky you might overlook it elsewhere, and thus “continuous hovering attention” is probably more promising. It is also a fact that the more light or distraction, the harder it is to see the stars. The lack of non-verbal visual cues in the online environment, such as tone of voice, facial expressions, gestures and physical appearance, similarly offers the possibility of fewer distractions. Traditionally, this lack of visual cues has been seen as a source of difficulty in online communication (Harasim, L 1987; Garrison et al., 2000) but the authors suggest that the chances for e-resonance and spontaneous, serendipitous selection are increased with fewer distractions. As we have seen, e-resonance occurs at the beyond verbal and beyond words level. It is more unconscious than conscious and cannot be controlled, but the online environment does have qualities that allow for e-resonance to occur. “[Dave Snowdon] presents his ideas in a manner that resonates with the audience. Great ideas need to be presented in a manner that sparks new connections and a desire for creativity in an audience”. From this we can see that affordances can be both for the reader/commenter/ ’reactor’/resonator and for the author. For the author the affordance of resonance is through the selection of aspects of the author’s writing by a reader/commenter, which can lead to further stimulation and inspiration through iterative feedback. This is where the combination of conceptual and person-to-person aspects of resonance works clearly like interplay, while in other cases, it becomes an entangled mix and the ‘riddle’ comes into play. For the reader the affordance of resonance is through stimulation of personal ‘new’ thinking. The question of whether resonance leads to ‘new’ thinking is worthy of further discussion as it is considered a major affordance of online resonance. Can we say that a reader/resonator’s ‘new’ thinking really is ‘new’, in the sense that it in no way originated from the author? Can the adjective ‘new’ be justified? The key to the justification and explanation of this idea lies in the concept of ‘beyond the verbal’ message (see section 4). If the idea for one’s own new thinking was not conveyed in the verbal message but via the accompanying components of the resonance phenomenon (as identified section 4), then it is reasonable to speak of ‘new’ because it was not articulated. This can be illustrated by the case where an online post might raise the same questions that the reader already has, or where the words alone do not do enough to stimulate interest and only vaguely identify the matter. If the accompanying resonance guarantees that the aspect is of interest to both reader and author, but that this has not yet been articulated, then the thinking is ‘new’. If the idea for one’s own new thinking was not conveyed via the accompanying components of the resonance, then there seems to be a very special mix of similarities and cross-pollinating diversity, of the verbal part of the message and the accompanying resonance phenomena and of the person-to-person and the conceptual level. This is important to recognise, since an affordance of resonance is not only the stimulation of similar ideas but also the stimulation of dissimilar ideas via the similarities involved in resonance. Resonance does not imply a tendency to group think or ‘echo chambers’ (McRae, 2006) but rather the affordance of diverse inspiration resulting from divergent as well as similar ideas. Thus the online environment enables e-resonance through connectivity and likewise the connectivity enabled by the online environment in turn enables e-resonance. Resonance itself affords the stimulation and sparking of new connections and ideas on social, conceptual and neural levels. Next Article # PLENK2010 – Breadth versus depth – an illusion? I’ve written something like this but my text will be published in Finnish and non-digital..
Bravo! I just read two blogs of PLENK2010ers and totally connected to both. Then just as I was contemplating why, I followed the link to this installment of your paper. Had never heard of e-resonance before and I’m so pleased to learn more. Your paper e-resonated with me. Hi Cris – Thank you! Just to say that I love the ‘banner’ on your blog – so there is an initial spark of resonance. I am running to catch up at the moment but am looking forward to reading your blog.